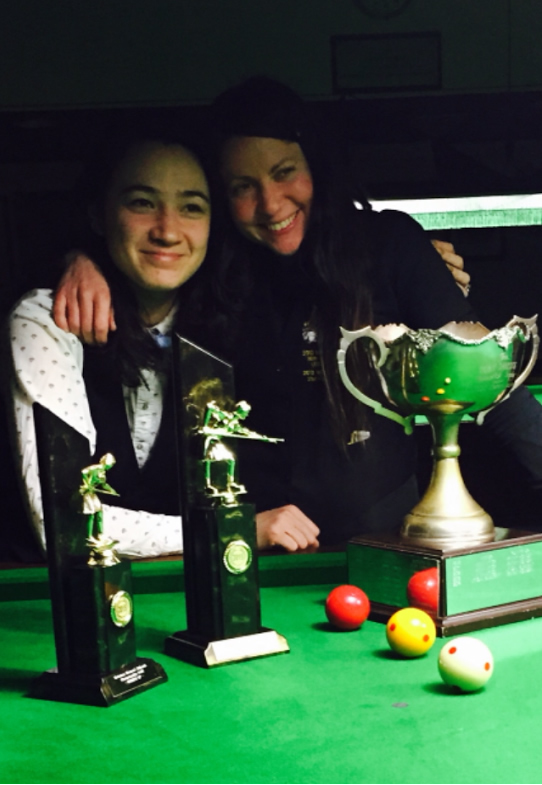 Congratulations to Anna Lynch on yet another Women’s Billiards State Title. Anna won all of her round robin matches and went on to win the title against Shelly Ames who won three of her four round robin matches. Anna had several breaks over 20, and a terrific 47 in the final, to which Shelly replied with a 25 on her next visit, so over 70 in two visits from the two finalists - great work ladies! The other competitors were Lyndal Element, Yvonne Mahoney and Michelle Hansen. Well done to all the ladies who participated. We had 10 ladies participate this year including two new faces, Hope Sumner and Maddy Melton. Both are juniors and both played very well for their first ever snooker tournament. With continued practice and improvement these two youngsters will push the more experienced players in the future. The event started with a round robin on Saturday and finals were held on Sunday. The top two players from each group went through to the semi finals. Semi final 1: Kathy Howden defeated Anna Lynch 3-0, Semi Final 2: Caroline Ruscitti defeated Theresa Whitten 3-0. Caroline went on to win the State title defeating Kathy 3-0 in the grand Final. 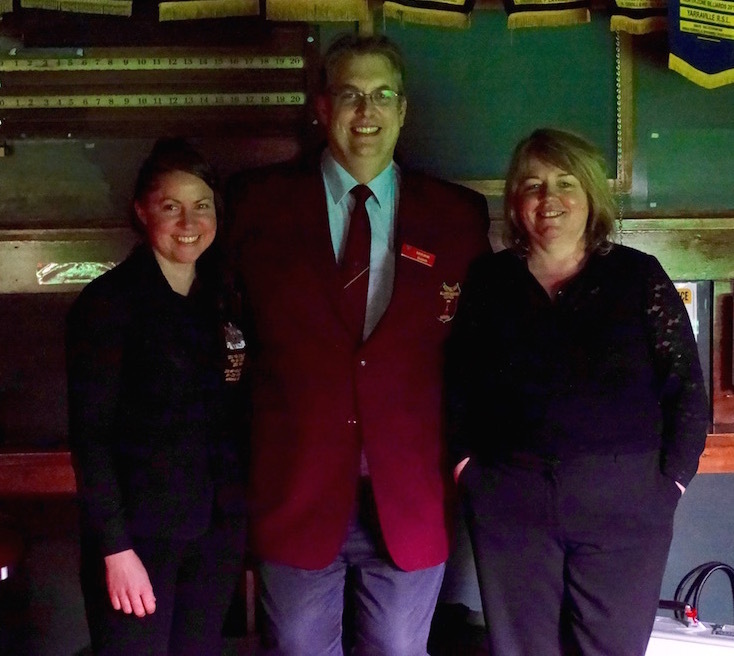 I would like to thank Neil Allison, who was roving referee on the Saturday and refereed the 1st Semi Final between Kathy and Anna as well as the Grand Final. I would also like to thank Shelly Ames (VB&SA Victorian Women’s Coordinator) for contacting players to ensure that the event would go ahead. I must say that it was a pleasure to deal with the friendship, honesty, fairness and skill that was evident over the entire weekend, thank you ladies. 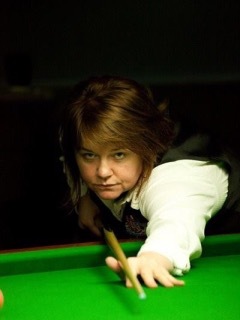 I always enjoy the Victorian Women’s Snooker Tournament and look forward to next year. 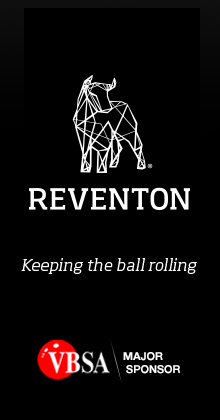 Sunday December 10th, at the Reventon Academy, commencing at 10.00 am. Round robin format - only $20 to enter. The 2017 Bob Hawke AC Australian Open Snooker Championship (13 to 15th October) & Open Women’s Snooker Championship (7th to 10th October) will be staged at Mounties, Mt Pritchard Community Club. The Opens are very prestigious Tournaments, and the VBSA strongly recommends all Victorian players consider entering. Refer attached Entry Forms or click on the below links to be taken to the ABSC Calendar Event. 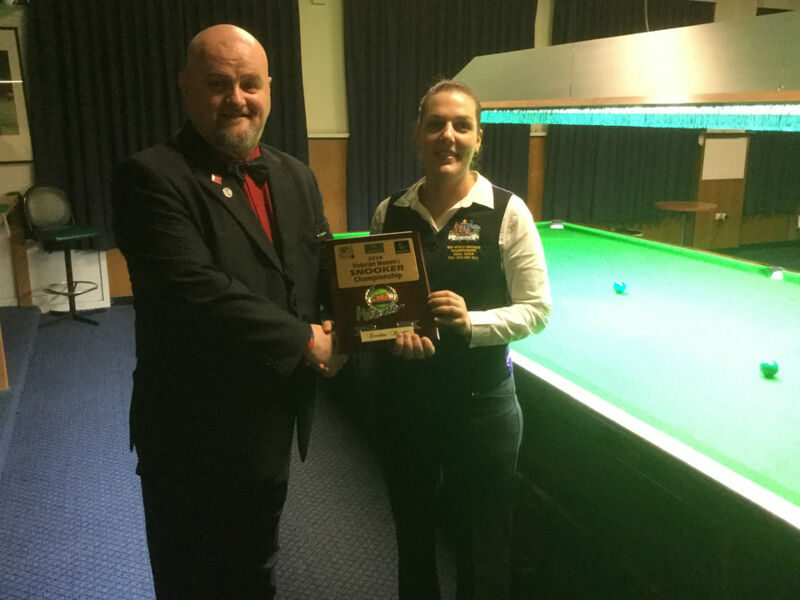 What a pleasure it was to Tournament Direct and referee the final of the Vic Open Women’s Snooker Championship for the 4year in a row. Unfortunately like last year the amount of entrants was low but despite this making my job easier, the final was a cracker. Anna was out to avenge her defeat last year to Kathy and naturally Kathy was out to defend her crown. Anna came straight out of the blocks with a commanding first frame. Kathy steadied and took the next 2 frames. With Kathy only needing one more frame to secure victory she was ahead but Anna came back strong including a clearance of the final 4 colours with some great pots to level it at 2-2. In that frame Kathy laid a very nasty snooker on Anna with virtually nowhere to go stuck hard up behind the brown and both balls just off the bottom rail with very little angle to work with to get out of and make it to the reds. I felt no matter what Anna tried it would be just a foul. Although she collected the yellow on the way through I stuck with the decision given the severity of the snooker and I knew Anna was doing her best in the attempt to get out of it. The girls were happy with that but Anna told me later she would have loved a couple of goes at trying it. Me too I guess, it certainly was, as they say in the classics, a Deusie. 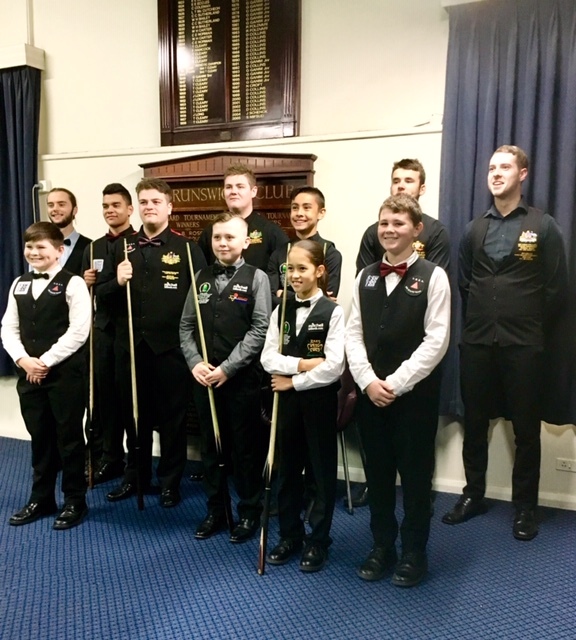 The men’s was played at the same time and despite them being 9 frames, and ours 5, our final frame was met with a large crowd watching the girls finish as Adrian Ridley had commandingly won 5-1 over Aaron Mahoney and his attempt at 3 in a row. Congrats Adrian. Thanks to all those guys and gals who waited and watched, the girls appreciated the attention and support. Kathy took control of the final frame with Anna trying very hard despite needing snookers before Kathy potting some final colours and putting the result beyond question, Anna graciously conceding. 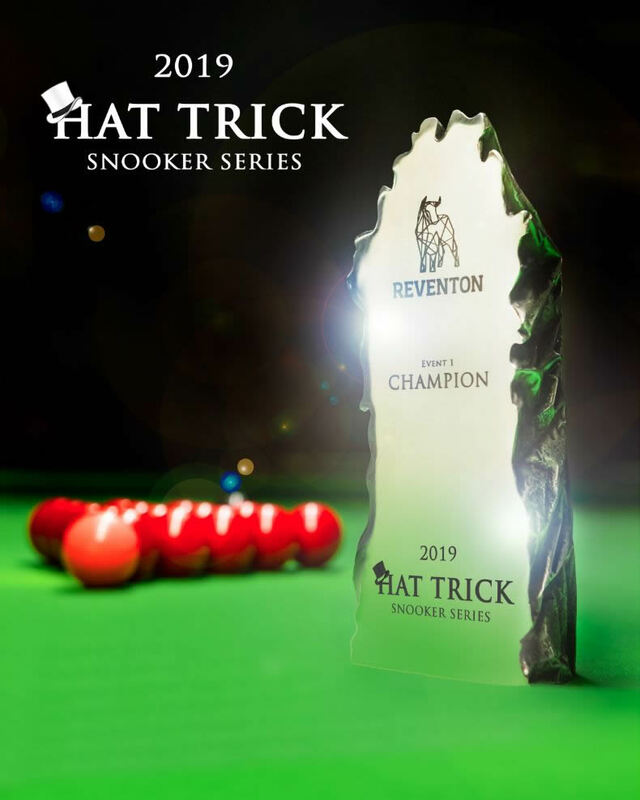 Some great safety and long pots played and if you want to see some of those great shots that put many of us blokes to snooker shame then watch the match on Cueball TV. It was fully recorded. Congratulations once again to Kathy and Anna, and thanks to Shelley for at least making it an event and Denis Coghlan for scoring for me. Ruby Roberts Memorial Victorian Women’s Billiards 2015. Entrants: Anna Lynch, Lyndal Ellement, Karen Waugh, Heidi Stubbs, Yvonne Mahoney, Michelle Hanson. Format: 40 minute round robin matches and a 90 minute final. On Saturday 30th May the Victorian Women’s Open Snooker Championship took place at Brunswick. It was a small affair with only Kathy Howden, Anna Lynch, Michelle Hansen and Shelly Ames. Unfortunately Kim pulled out earlier. The first rounds were a Round Robin with no Semi Final naturally and after two rounds Anna and Kathy had the most wins. So we jumped straight into the 7 frame final on Table 1. Shelly and Michelle played off for 3rd and 4th. Kathy came out of the blocks with a 31 in first frame and a superb 46 in the second. She took the third and at the break had a commanding 3-0 lead over Anna. Anna came back from the break and secured the 4th frame but Kathy won the 5th and the title 4-1. Although it was just me and the 4 girls, it was a great day, all played with great sportsmanship and it was a real pleasure for me to be there. And I must say that all the ladies played some stunning snooker. Kathy’s superb breaks in the final plus Shelly had two breaks over 20, one of 25 and one of 23. Anna played some amazing safety and snookers. And to Michelle’s credit she navigated out of some tough ones, including a specific snooker laid by Anna nearly the full length of the table through the baulk colours on a tight angle back up the table to the last remaining red surrounded by pink and black. She made the out and didn’t leave the red on, it was accordingly acknowledged by Anna and I. It was the 3rd straight year for me officiating at the final for the Women’s and I hope to be part of the tournament next year. Congratulation’s once again to Kathy our Winner and Anna our runner up. ASADA has approved the 2015 ABSC Anti Doping Policy which is effective 1 January 2015. All players should be aware that this policy has been included as a condition of membership and will be included in all tournament entry forms. In particular, the top players (junior and senior) who often represent Australia overseas should ensure they are well informed on this subject. It is their responsibility to be free of drugs and substances and to know exactly what is prohibited.